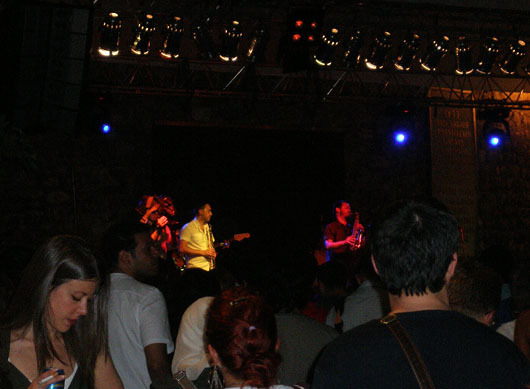 Home » Istanbul » A Concert Under A Medieval Tower! 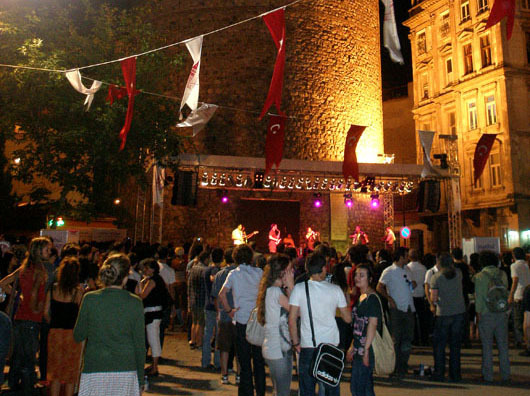 A Concert Under A Medieval Tower! 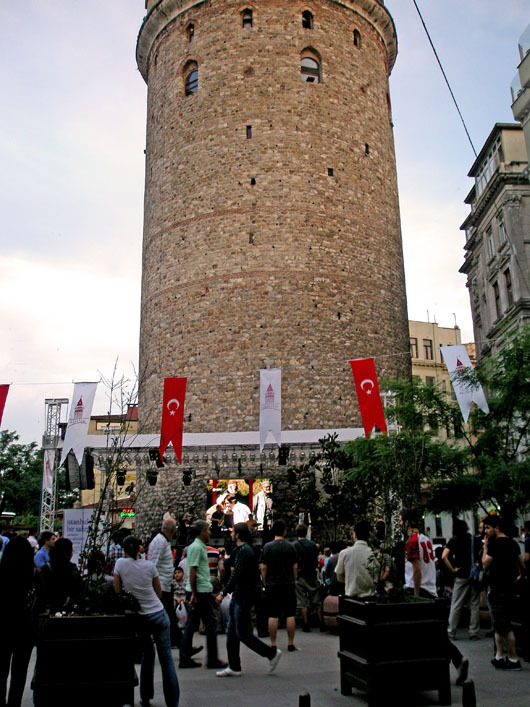 The plan was to walk up to the Galata Tower with our friends, stop for a snack at one of the little cafes in this newly gentrified neighbourhood and then take a cab across town to the uber cool Ulus29 for dinner. When we spotted a stage being readied for a concert right beside the tower, we girls gushed “How romantic!”. The guys didn’t seem too thrilled of course and didn’t quite get the ‘romance’, but agreed to stay on rather reluctantly. 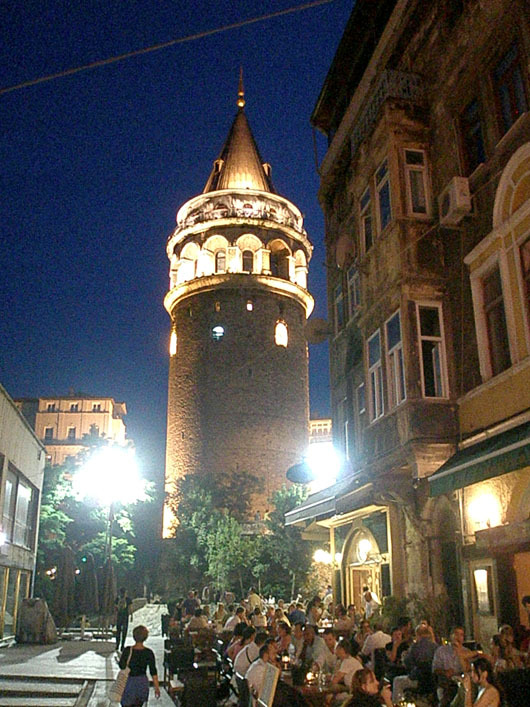 Cafes around the Galata Tower. We ate in a restaurant across the street which was a lot less crowded and came with recco’s from ‘Istanbul eats’. Thankfully our simple seafood dinner at a tiny restaurant across the street, called Furreya, turned out to be one of the best meals of that entire trip! And the concert? Magical and well worth the wait! 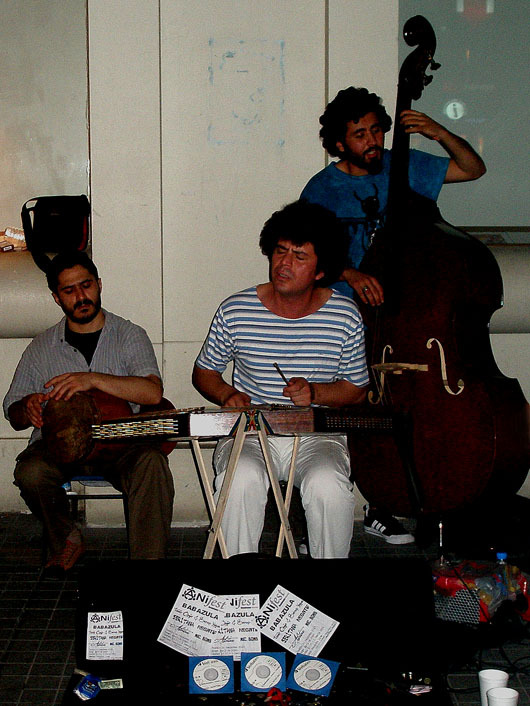 On our way back we stopped to listen to these street performers on Istiklal street. They were surprisingly good and we appreciated the fact that they insisted we accept their CD in exchange for the tip. OUR guys were kind of mollified when I suggested we stop at 360 – a bar/club – on the way back, for cocktails and more music. The cocktails were OK, the music great and the views certainly didn’t disappoint. The two of them took no chances the next evening however. They opted to linger over coffee and people watch (people? I later overheard “gorgeous lady in a green dress”) while we explored the lanes off Istiklal, shopped, and got our fortunes read from coffee dregs! They sure missed out…….I think. Do be sure to check out all the other entries here. Aren’t they always the best? And wonderful images to illustrate your story Madhu. It really was. This was our second visit to Istanbul and the company of dear friends elevated those five days to some of the best of our lives! Had some great food as well, but no pics unfortunately. Somehow never thought to photograph food during my pre-blog days 🙂 Glad you like the photos. They are just a wee bit better than my other night shots. I hadn’t noticed that there was anything less spectacular about these pictures than your daytime shots! Five days with friends in an exotic and sophisticated city like Istanbul sounds like a wonderful holiday. What a nice thing to do. To have had this impromptu concert the icing on the cake … no, I should say the syrup on your baklava! R and I made our way there in 75 (living in our van in the parking lot of the Blue Mosque), and I remember the food being wonderful, but I guess there’s a whole new level of restaurants and eating destinations these days! 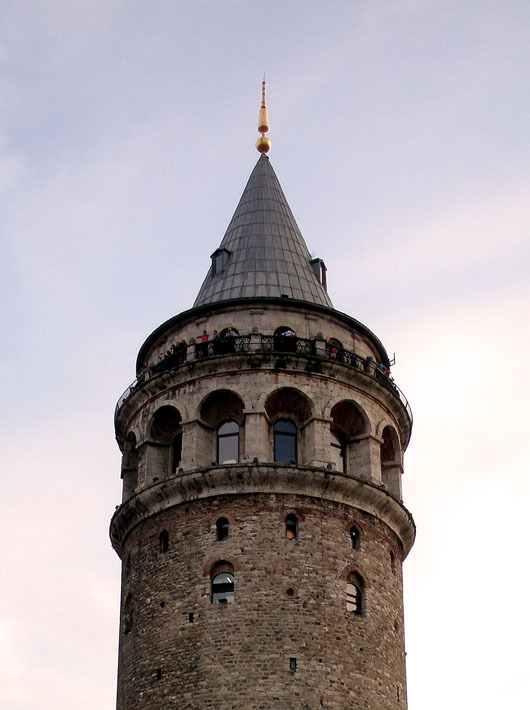 To begin with, I love that tower … what a magnificent work of art! I’ll bet this is an experience you will never forget. Giving a CD away in return for a tip is a smart move on behalf of the band, too. No doubt, they will obtain quite a bit of exposure through their generosity. 🙂 Another great share, Madhu … as always. Have a great day! Thank you Marcy. I love that tower too. We had missed it on an earlier visit with a tour group and were determined to see it this time. Oh yes! It was great fun! What fun! Your evening was full of pleasant surprises, and what sound like very happy memories. Thank you for sharing some of them. My pleasure entirely Elisa! That was a very special trip with friends! cool shots, madhu! that looks like a fun place! Thanks Stephen! I doubt it is usually so lively. But it was magical on that day. Glad you liked it Ailsa. Rhythm of place for me would have to be the Syrtaki from Greece actually! Every time I listen to the strains of ‘Zorba’s Dance’, I am transported to the magical alleys of the Plaka! I didnt have pictures to illustrate it though. Cool Madhu! I am not sure yet if I will do this challenge. It is tricky but you have managed to capture it well, as always! Thanks Nicole. I am surprised I took these pics. I rarely did in the evenings or when we sat down to a meal, before I started this blog! Sounds like it was a wonderful evening and beautiful images ~ thanks. It sure was Susan! Thank you. Hi, I’ve nominated you for the Kreative Blogger Award! Yay! Thank you for the nomination Jordanna! I am touched and delighted. The header photo is absolutely stunning! Yet another reason to go to Istanbul. Thank you Jo! Istanbul is one of my favourite cities! Madhu, the photos are enchanting, and the evening sounds wonderful too. I always enjoy hearing the stories woven into the post, and you do that so well. The spontaneous events of the evening have been captured beautifully and will be etched in our minds forever! Thank you for the pictures Madhu. We did have a grand time didn’t we? Maybe you and I should plan another trip together sometime! You are a walking encyclopedia….I guess now I should say…you dont need to google with you around!! Glad to see your talent is being appreciated. How about a mediterranean cruise? Looks like you ran into a party. What a fun place to be. We did 🙂 Thanks Francine. Cool. You must have had great fun. It did Mags 🙂 Thank you for checking this out. I always love following the music to all tourist spots. They really should not be underestimate as part of the locations. Absolutely Rommel. We always make it a point to buy local music CD’s as souvenirs. Thanks for stopping by. Great post – and the photos of the tower are awesome! What fun – sometimes things all come together! Music, great food and beautiful views. I enjoy reading. So glad you did 🙂 Thanks for stopping by! It certainly was! Thanks for dropping by Jo. Green dress, eh? Yeah, people watch…hmmm. Great post! Love it, thanks for sharing. Yeah, differing ideas of fun 🙂 Thanks Arnel. Instead of buying souvenirs from my travels, I do what you did. I bring back the music that I heard instead, in whatever form I can find it. That way, when I play the music, I am brought back to the time and place I first heard it. Street musician CDs are a fun way to do this…in Italy, I followed music that was piped down the streets to a local music store where I asked what was playing. The owner of the store popped it out of the player and gave it to me! It ended up being a Viennese waltz that I heard in Italy…but now, they represent the same memory to me. I could almost hear the music… Great photos too. Concert by the tower, wow! Just vibrant, fun and exciting. Beautiful images that makes me wish I was there to see it all. Thanks for sharing.